An Ultimatum was then considered as an affront to the fighters and the people who have formed the bodies many struggle / militia. An Ultimatum was rejected by the Indonesia with the reason that the Republic of Indonesia had been standing People's Security Army, and TKR has also been formed as the host country. In addition, many organizations armed struggle that has been formed the community, including among the young, students and students who opposed the entry back Dutch government military presence that memboncengi UK indonesia.pada 10 November morning, the army British launched an attack on a large scale, which started with a bomb air to building the Surabaya, and then gathered around 30,000 Infantry, some aircraft, tanks, and the ship war. 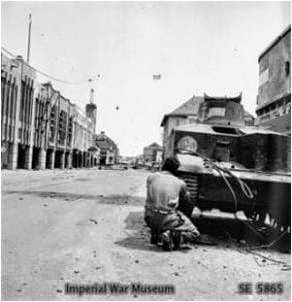 Various parts of the city Surabaya was bombarded with and shot with artillery fire from the sea and the dry land. Opposition forces and militia Indonesia then flare up throughout the city, with the help of the people who are active. People engaged in this battle resulted in thousands civilians fall victim to in the attack, both died slow were injured. Bung Tomo in Surabaya, one of the revolutionary leader Indonesia's most respected. Photos is famous for many people who were involved in National Revolution Indonesia represent Indonesia's main revolution life struggle at the time. Beyond the United Kingdom who suspected that opposition in Surabaya can be defeated in tempo for three days, the public figures such as a pioneer young Bung Tomo that great influence in the community to continue stirred up the spirit opposition youths Surabaya that resistance will continue in the large-scale attacks Britain. Different religious leaders, consisting of the Muslim scholars and kyai-kyai pondok Java KH Hasyim as Ash'ari, KH Wahab Hasbullah and kyai-kyai Islamic boarding schools were also mobilized students and civil society as their militia resistance (at that time the community is not so obedient to the government but they obey and obedience to the cleric) shingga opposition parties by Indonesia for a long time, from day to day, from Sunday to Sunday. The people that initially will be done spontaneously and not coordinated, the more days more and more regularly. Battle of large-scale this year reached up to three weeks, before the city of Surabaya finally fell in the hands the United Kingdom. al for Indonesia's resistance against colonialism. After killing Brigadier-General Mallaby, his successor, Major General Mansergh issued an ultimatum to say that all the leaders and the Indonesian armed forces have reports and put his armor in the place determined and gave himself up to set up his hands on. An ultimatum deadline is at 6.00 , morning on November 10, 1945. 0 Response to "History wars: The Battle of Surabaya "